The M/T Burmah Agate was an oil tanker that was involved in an oil spill near Galveston, Texas in 1979. 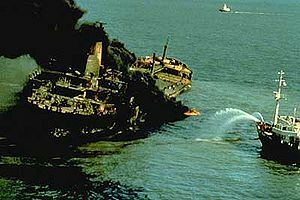 On the morning of November 1, 1979, the Burmah Agate, while in the customary anchorage area for the Port of Houston inbound to Galveston Bay with 400,000 barrels of fuel, was struck by the outbound freighter Mimosa just outside the entrance to the Galveston Bay Entrance Channel. Both vessels were Liberian flagged, owned by Chinese interests. The Mimosa struck the Burmah Agate on its starboard side, tearing an 8 feet (2.4 m) by 15 feet (4.6 m) hole near Cargo Tank No. 5, and setting off an explosion that ignited the leaking oil. The tanker foundered, while the freighter remained under way, slowly circling about a dropped anchor. The U.S. Coast Guard dispatched Sikorsky HH-52A helicopter tail number 1426, currently in the Smithsonian Air and Space Collection,  and the cutter Valiant to begin search and rescue operations lifting men off the ships using helicopters. By 12:30, all 26 crew members of the Mimosa had been accounted for, but only 4 of the Burmah Agate's 37 crew survived, and 4 bodies were recovered. Unable to shut off the Mimosa's engines due to the fires, the rescuers eventually fouled its propeller. ^ "Casualty Database". Center for Tankship Excellence. 2012. Retrieved 19 July 2012. This page was last edited on 14 November 2018, at 16:03 (UTC).